I was wondering why I was finding it hard to get excited about the Spring Equinox this weekend. Then it hit me. I’m in mourning for winter. The Spring or Vernal Equinox is a time of balance, when day and night are relatively equal. It signifies a change in power between day and night. After the Spring Equinox the day wins ascendancy as long nights are overtaken by longer days. My short cold days and comforting long nights are almost over. I will miss them but know they will return when the wheel spins its way to autumn once more. To mourn the loss of winter I thought I would create a variation of a Black Velvet. The Black Velvet was supposedly created by a London bartender in 1861 to mourn the death of Queen Victoria’s beloved Prince Consort, Prince Albert. The colour of the drink was meant to symbolise the colour of the black armbands worn by mourners. A Black Velvet is a mix of equal parts champagne or sparkling wine and stout. To make, fill a glass halfway with chilled sparkling wine or champagne then slowly top with chilled stout. A Poor Man’s Black Velvet, also called Mud and Blood, is a variation of a Black Velvet which substitutes the sparkling wine or champagne for apple or pear cider. One way of serving either drink is to try slowly pouring the stout over the back of a spoon into the sparkling wine or cider. If done right, the stout will sit on the top and create a layered effect. I tried this but failed 🙂 If you can achieve the separation of colours, these Black Velvets would be perfect for the Equinoxes as they visually symbolise the balance between day and night. While I am celebrating the Spring Equinox, I am also mourning the end of winter and its long cold nights which were warmed by comforting hot drinks. To commemorate this loss I thought I would make a warm and spicy mulled version of a Poor Man’s Black Velvet. I’m calling it a Dark Queen’s Black Apple. Using a knife or vegetable peeler, peel the skin from the orange leaving behind as much of the white pith as you can. Place the orange peel and all the other ingredients into a saucepan. Simmer gently over low heat until the sugar has dissolved and the drink is hot but not boiling. Strain into heatproof mugs or glasses. You can reheat it or drink it chilled. It’s Equinox time – a time of balance and renewal when day and night are as equal as can be. In the Northern Hemisphere, the nights will now be longer than the days. In the Southern Hemisphere, the days will now be longer than the nights. As I think of the long hot days ahead I think of drinks. So I thought it would be fun to play with the concept of balance through drinks and our sense of taste. Taste has five sensations – sweet, sour, salty, bitter and umami. Over the coming weeks I will explore each sensation through a drink. I’m starting with sweet. Sweet is one of the easiest to work with as it is a pleasurable flavour and there are so many delicious sweet drinks around. But that is also a problem – with so much choice how do you choose? One of my favourite sweet flavours is rose water. I thought a rose water cordial would be lovely. I was chatting to my friend who runs a bar about my thoughts for a sweet rose water cordial. He was brought up in Malaysia and told me about a drink from his youth – bandung. It’s a rose water syrup drink sweetened with condensed milk! Can you get anything sweeter than condensed milk? Possibly, but the thought of a rose water and condensed milk drink had me running from the bar to my kitchen. 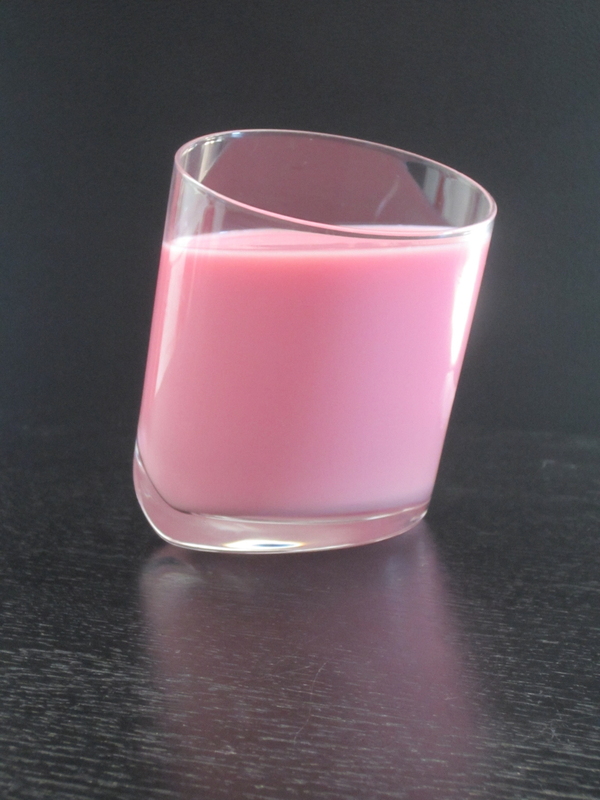 Here is my version of the very sweet, very delicious and very pink bandung. Boil the sugar and water until the sugar dissolves. Add the rose water and enough food colouring to achieve the desired pink colour. Add the condensed milk and water and mix until combined.